Like many industries, dentistry has changed dramatically over the past 10 years. The common thread among many of the changes we have seen at Elmwood Dental is the application of computers to the practice of dentistry. As computers become faster and are able to perform many more functions, they have been applied to most of the dental procedures we are known for at Elmwood Dental. In order to decide if these newer, computer-based procedures should replace the conventional analog procedures we perform, we have asked the questions, does the newer technology make the outcome better, and safer. Here are a few of the exciting dental technologies that the dentists at Elmwood Dental use every day, that have made practicing dentistry so much better for the patient experience, and outcome. 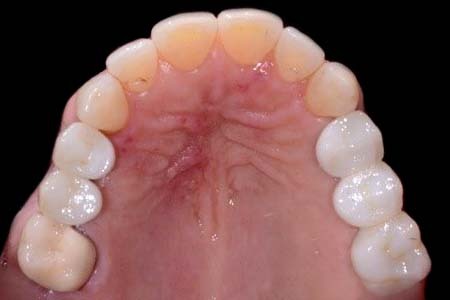 Over the past fifteen or so years, several companies have produced and marketed systems capable of producing ceramic crowns through digital imaging rather than the traditional, messy impression materials. 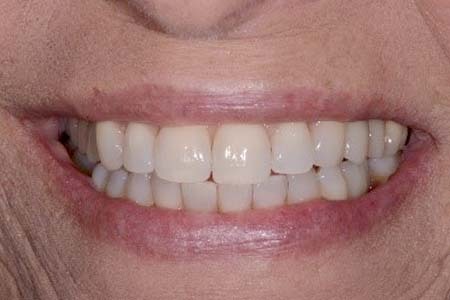 The doctors at Elmwood Dental have tested and researched many of these “optical scanners” to ensure that the result would produce the most exacting digital impression of the teeth to be restored. 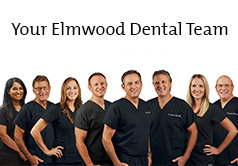 In 2014 Elmwood Dental transitioned to the Trios Optical Scanner. This hand- held device, creates a digital impression file that is transmitted to our dental technicians. The accuracy of these digital impressions surpasses the regular rubber-based impressions of the past. 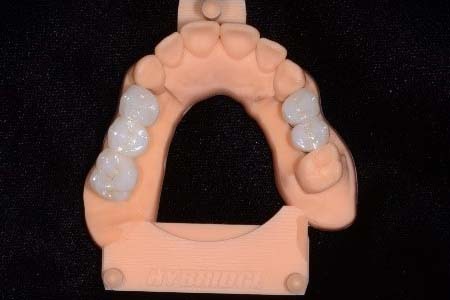 Once the patient mouth has been captured, the technicians begin the CAD CAM process, of computer design, and computer manufacturing. 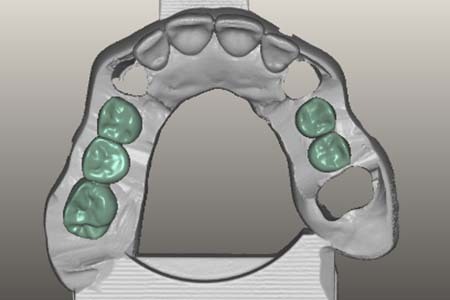 Trios digital impression of the upper teeth and 4 dental implants. Computer Aided Design of 5 implant crowns. 3-D Printed cast with the new computer milled crowns. Final ceramic crowns after completion. The patient smile fully restored. From analysis, thorough planning and placement, to complete restoration, CBCT empowers our implant and restorative doctors with surgical predictability and treatment planning in full 3D, all with restorative outcomes in mind. 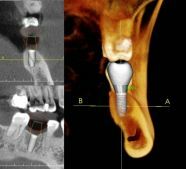 The CBCT high resolution, volumetric images provide complete 3D views for more thorough analysis of bone structure and tooth orientation. For our patients, this means the most predictable, outstanding results with no anxiety about unforeseen complications. CBCT allows us to collect precise data and measurements regarding bone levels, surrounding anatomy, concavities and bone height. 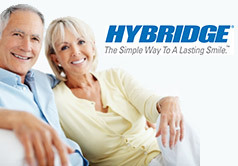 Especially in the case of multiple implants and HYBRIDGE, we are able to determine perfect positioning. We are able to map an entire course of treatment from surgical placement of the implant and abutment, all the way to final restoration. 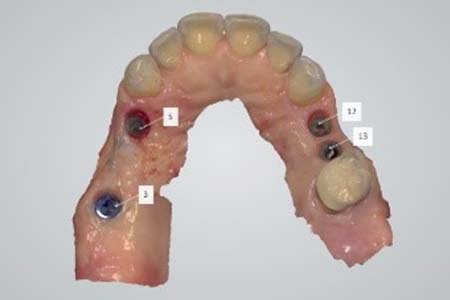 After planning your treatment on our software we can produce a custom implant surgical guide. Not all things are created equal. This is as true a statement in dentistry as in any area of life. 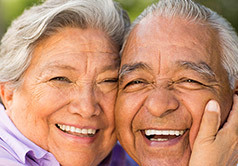 Just like you have choices at the hardware, grocery, or clothing store, dental providers have choices when it comes to the materials and instruments being trusted to restore and maintain your oral health. Today when insurance driven healthcare forces providers to accept lower fees for services, some providers shorten appointment times and potentially compromise the quality of care and biomaterials they provide. The public's understanding of provider's choices in biomaterials has never been more important. From filling materials and fluorides, to implant and surgical technology, to the quality of alloys and ceramics used in your crowns, not all things are created equal. At Elmwood Dental Group, although we do participate with some insurance providers, we are not a fast paced, insurance driven office. We do not cut corners with your healthcare. 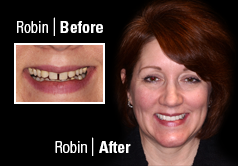 Our dedication to dentistry and to the quality of care we provide has never been higher. For this reason, we use only the safest, strongest, and most technologically advanced materials available. 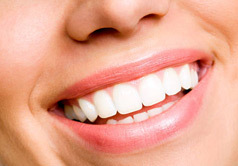 When you open wide, you have the peace of mind that you are being treated with the safest, best dental bio-materials in the world, and our dedication to continuing education and continual improvement ensures this will always be the case. It is no small undertaking for a well established office to convert our files and traditional paper charts to a digital system. Our digital office works to ensure the most accurate, reliable, and organized system available to access and maintain your records in a secure and efficient manner. Better yet is the adoption and use of the latest in digital radiology. This technology not only produces more accurate, predictable images, but does so in a manner that allows us to easily show you what we see on our computers. Best of all, this uses approximately one half the radiation as that of traditional x-rays, making the annual exposure the American Dental Association recommends for dental radiographs effectively negligible for the patient. Paired with our intra-oral cameras in each operatory, this system is truly state of the art – all to allow us to provide you the best care possible.